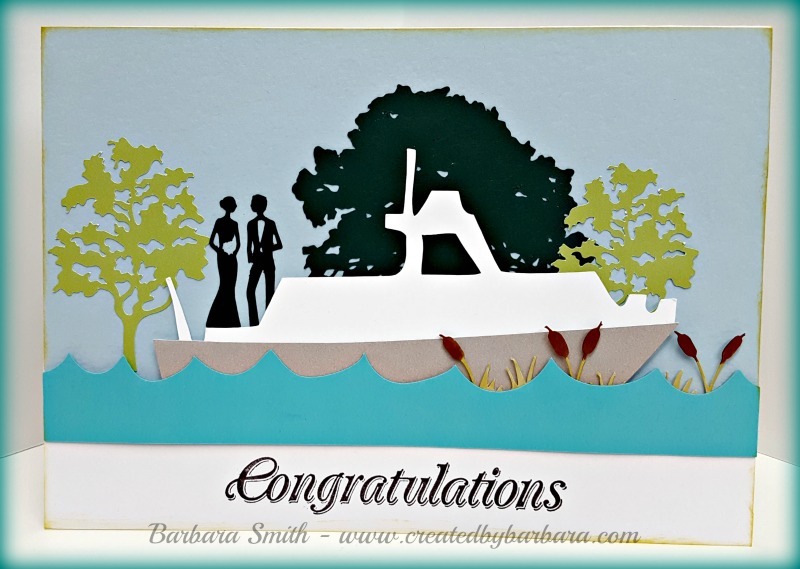 Created By Barbara: Boat Wedding! Where Paper and Inspiration come together! Well hello there! Today, I have a wedding card for a couple, who gets married on a boat. Not a bad way to get married, right? The bride & groom are from the CTMH Artiste Cartridge. The boat & water are from the Stand and Salute Cartridge. The cattail border is from the Paper Dolls Everyday Cartridge. The smaller trees are from the Heritage Cartridge. The larger, darker tree is from the Botanicals Cartridge. This post contains affiliate links. You won’t pay any more when you use these but I will earn a small commission on any purchases you make after clicking on them and I greatly appreciate it. Thanks for helping support my blog!!! As you can see, I used a blue background for the sky and piled everything else on top of that. First I attached the large dark tree and then the smaller, lighter trees. After putting the boat together, I popped it up and then placed the bride and groom where I wanted them. After that, I put in the cattails and the water on top of that. This is a 5x7 card and as you can see, I left a space at the bottom for the sentiment. I also edged the entire card with a Color Box Cat's Eye ink pad - these are great for edging! Thanks so much for stopping by & hope you have a beautiful day! Thank you for stopping by! I would love to hear your thoughts. Have a blessed day! Hey there, it's Barbara, designer of all that's paper. If you have a project or just want a card for a specific event, I'd love to help. Paper is my passion. Thanks for checking out my blog. Have a blessed day! This is a wonderful devotioal for parents and children! © Barbara Smith and Created By Barbara, 2015. The content of this blog is for personal inspiration only. Unauthorized use and/or duplication of this material without express and written permission from this blog’s author and/or owner is strictly prohibited. 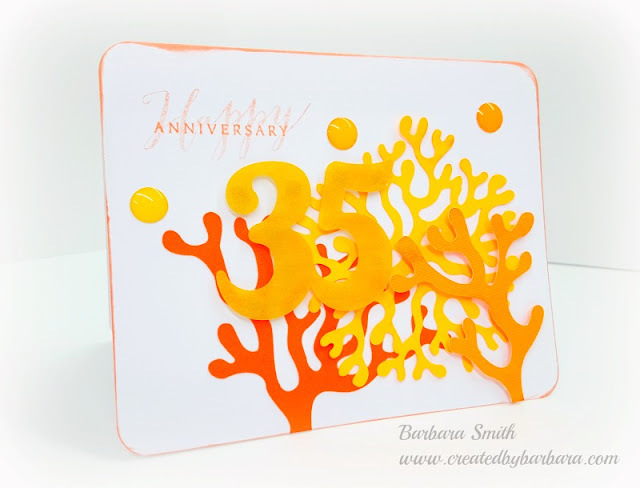 Excerpts and links may be used, provided that full and clear credit is given to Barbara Smith and Created By Barbara with appropriate and specific direction to the original content. © Barbara Smith and Created By Barbara, 2015. Awesome Inc. theme. Powered by Blogger.